On November 12th (2013), it was confirmed that the new U.S. Ambassador to Japan is to be Caroline Kennedy. She is the daughter of the late former U.S. president John F. Kennedy. 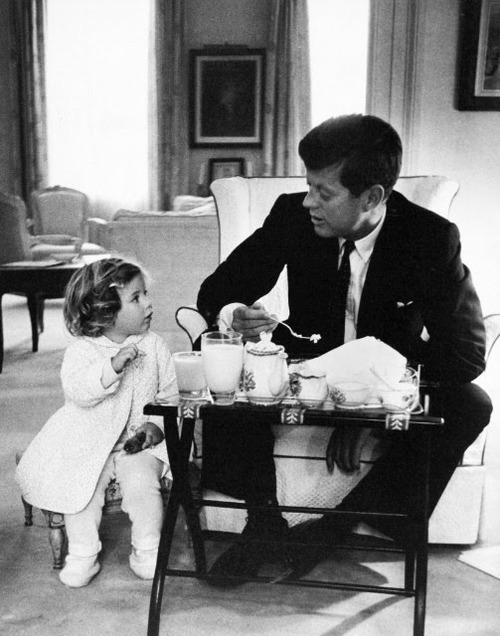 Caroline Kennedy as a small child with her father, John F. (“JFK”) Kennedy. She and her family will move into the U.S. Ambassador’s residence in Tokyo tomorrow…one week before the 50th anniversary of the 1963 November 22nd assassination of her father, JFK. Caroline Kennedy and her husband are reportedly very fond of Japan…they spent their honeymoon in 1986 in Kyoto, Japan. Did you know that there are Japanese 桜 (cherry blossom) trees in Washington DC? And that they have an annual Japanese-style cherry blossom festival when the flowers bloom in the spring? And did you know that those trees were a gift to America from Japan about sixty years ago? Well…did you know that both Japan and America crown a Cherry Blossom Queen every year? It isn’t a beauty contest type of competition. Each state in America and each prefecture in Japan enters a young woman into the competition based on community service that she has done. And then the country’s Cherry Blossom Queen is chosen by a random draw. Every year the U.S. Cherry Blossom Queen comes to Japan and meets the Japanese Prime Minister along with the current Japanese Cherry Blossom Queen. Last year, the 2012 U.S. Cherry Blossom Queen was an African-American woman for the first time. She made headlines in Japan! The 2013 U.S. Cherry Blossom Queen, Mary Anne Morgan, just came to Tokyo and met Japanese Prime Minister Abe and 2013 Japanese Cherry Blossom Queen, Chiori Kobayashi yesterday. First of all, today (2013 March 26) is the fifth anniversary of my blog. I wrote the first post on 2008 March 26. As of today, my blog has gotten about 1,600,000 hits … that averages to about 895 hits per day over the five years – – but that’s not really accurate because my blog averages 1000 hits a day now, but less than 50 a day when I first started it in 2008. Thanks to all my site’s visitors … especially you! Please leave a comment! Anyways, I found out about a new movie about post-WW2 Japan titled “Emperor” starring Tommy Lee Jones as U.S. Army General Douglas McArthur. Do you know who Gen. McArthur was? He is very well-known in Japan. General McArthur was in charge of the U.S. military during the war against Japan … and also during the occupation of Japan after the war ended. Japanese people respect McArthur because he respected the Japanese people. Tommy Lee Jones is also respected in Japan. He is known to everyone here as the “face” of Suntory’s Boss Coffee. In the Boss Coffee TV commerials, Tommy Lee Jones acts and sounds like a Japanese man. Have you seen the movie “Emperor” ? Yesterday (2012 August 6th) was the 67th anniversary of the atomic bombing of Hiroshima (August 9th will mark the same anniversary of Nagasaki). Harry Truman was the U.S. President in 1945 who ordered the atomic bombings of Japan. Every August, there are ceremonies in both Hiroshima and Nagasaki to remember those who died in the bombings…and to try to ensure that no other nuclear weapons are dropped on any other city in the world. Yesterday, for the first time ever, a member of former U.S. President Harry Truman’s family attended the ceremony in Hiroshima. 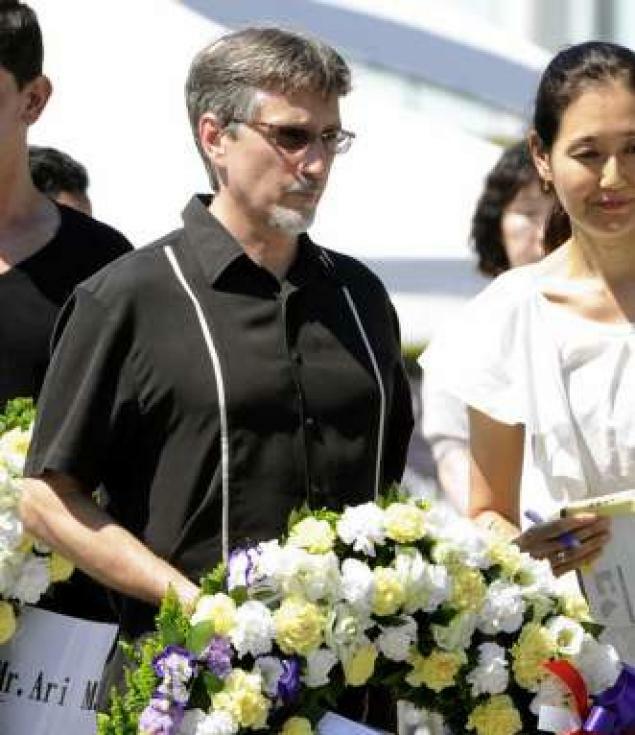 Harry Truman’s grandson laid a wreath of flower at the Peace Memorial in Hiroshima.